The rate at which the protein beta-amyloid accumulates into the sticky plaques associated with Alzheimer's disease (AD) is already slowing by the time a patient would be considered to have preclinical AD, according to a longitudinal study of healthy adults published in JNeurosci. The research suggests that anti-amyloid therapies would be most effective before individuals reach the threshold for preclinical AD, long before the first signs of memory issues. Determining how early to intervene is a central challenge in slowing the progression of AD. Clinical trials of drugs for lowering amyloid levels typically involve individuals who do not yet have symptoms but are considered "amyloid positive" and at risk for developing AD. These trials have been largely unsuccessful, perhaps because they begin too late. To untangle the relationship between beta-amyloid, the AD-associated protein tau, and memory impairment over time, Stephanie Leal, William Jagust and colleagues studied healthy men and women between the ages of 61 and 88 over a five-year period. Brain scans revealed that even trace amounts of beta-amyloid predicted future levels of tau, and both preceded memory decline. 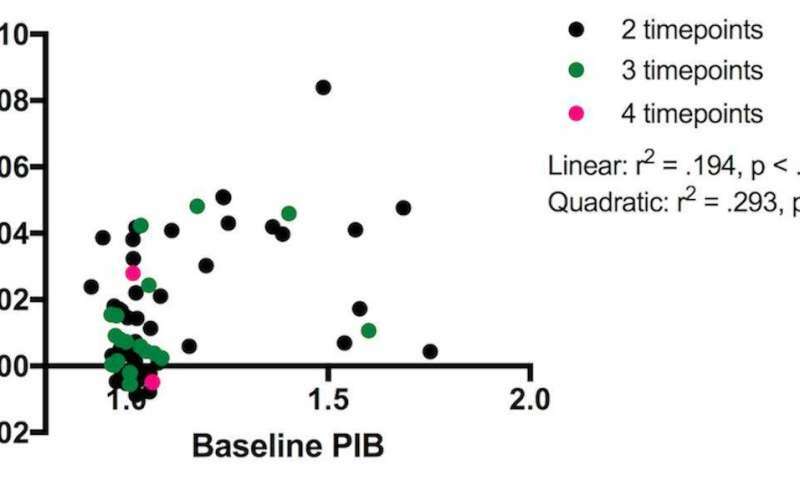 The researchers found that greater baseline levels of beta-amyloid were associated with a faster rate of accumulation, but only to a point, after which higher beta-amyloid levels were associated with slower accumulation. Anxiety: An early indicator of Alzheimer's disease?